mix the whipped cream with milk and 2 tbsp peach syrup mix well until it's thick. beat the eggs and sugar together ( add the sugar gradually ) until very pale and thick for 5 minutes. add vanilla and mix well again. sift the flour and add salt and baking powder , add the flour mixture gradually to the egg and sugar mixture and fold gentely. pour the mixture in 30 x 25 floured and greased baking sheet and bake at 180 celsius for 8 to 10 minutes. when it's done sprinkle a clean tea towel with powdered sugar and transfer the cake onto the towel. 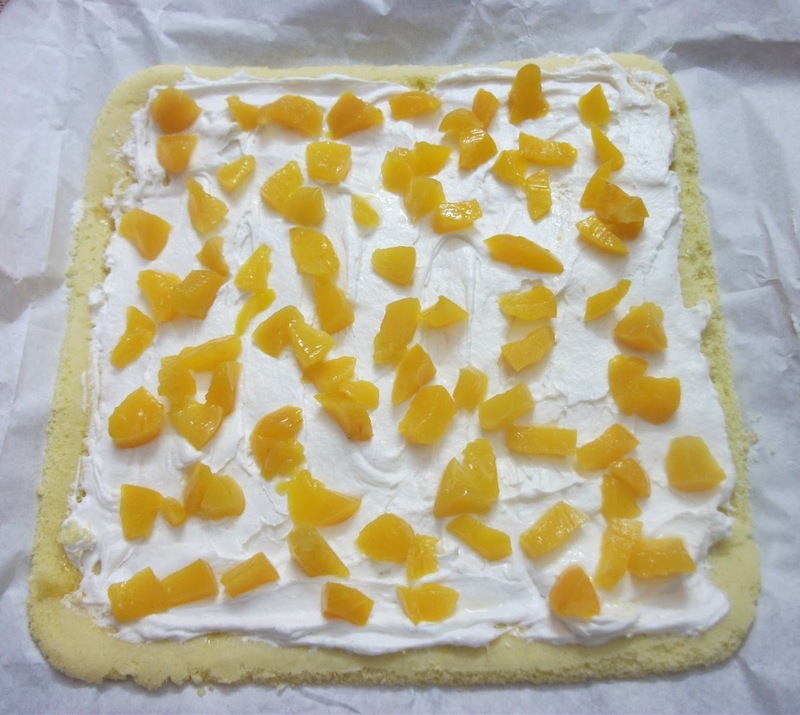 put the peach syrup on the cake using brush and put some of the filling cream and small pieces of peaches . then roll the cake in the tea towel. now put the topping and sliced peaches. stir the gelatine in peach syrup and put it on top of the sliced peaches using brush.